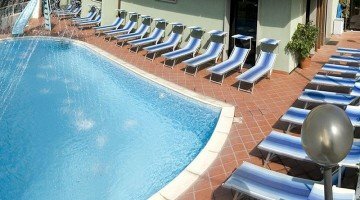 Elegant and refined, Hotel Executive La Fiorita , 4 stars of Miramare, is located in front of the sea front line with direct access to the beach and many benefits such as a heated swimming pool, free WI-FI and fully air-conditioned rooms. Reserve guests free entry to the Amarea floating water park and allow pets up to 12 kg. This hotel adheres to the Green Booking project and has decided to donate a tree to the coast for a healthier environment and a more sustainable tourism. 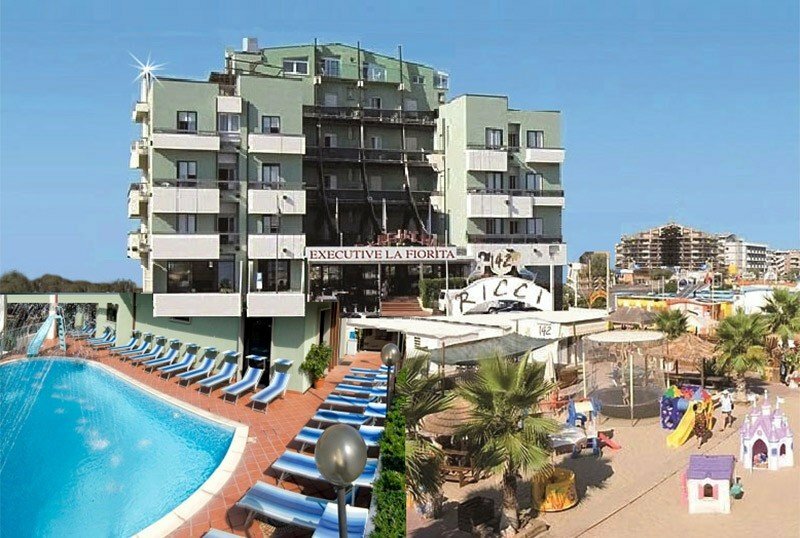 The hotel is located in Miramare di Rimini, right on the seafront and a few steps from the main promenade. The village is well connected by public transport, with the bus line n. 11 you can easily reach both the center of Rimini and Riccione. The Rimini Thermal Baths are just a 10-minute walk away. All rooms are soundproofed and have a balcony, electric blinds, electronic card door, air conditioning, 26 '' flat screen satellite and digital terrestrial TV, WI-FI, minibar, digital telephone with external line, automatic alarm clock, safe electronics and private bathrooms with hairdryers, walk-in showers and marble sinks. Sea view on request. Heated swimming pool with slide, garden, equipped open-air porch, free use of bicycles, sun terrace, common room with TV and newspapers, lift, panoramic dining room. Finally, available to customers: no limits water dispenser, welcome drink, courses of Caribbean dances, zumba and yoga, beach towel, umbrella and cabin on the beach (extra charge for sunbeds). On request: laundry service. PARKING: free, fenced and guarded. CONVENTIONS: beach, amusement parks of the Riviera, discos, gyms, spas, Inail / Inps covenants. Free entry to the "Amarea" floating water park. Excursions are organized on request. PETS: allowed up to 12 kg, on request. LUNCH AND DINNER: the restaurant has an à la carte menu, with 6 choices at every meal and recipes of local, international, pasta and homemade desserts. Meals are served in the panoramic dining room. VARIATIONS: vegetarian dishes are prepared on request. OTHER: theme nights with tasting of traditional dishes from Romagna and other regions. Every afternoon, for the little ones, a sweet snack is served with biscuits, sweets, bread and nutella. In the hotel: swimming pool with shallow water, indoor and outdoor playground area, baby / mini / junior club with live entertainment and afternoon snack by the pool. Upon request baby sitter and pediatrician service. At meals: common bottle warmers, table seats and dedicated menus. There is a kitchenette for parents with vegetable soups, vegetable or meat broths, pastries, fresh milk and cheese. On the beach: entertainment, children's playground area, baby / mini / junior club. The heated outdoor pool has a depth ranging from 80 to 140 cm and is equipped with a waterslide, dancing fountains and a solarium area. From the hotel to the affiliated bathing establishment Bagno Ricci n. 141-142-143 there are only a few steps away. At guests' disposal: umbrella and cabin (extra beds for a fee), fitness area, bike service, bocce courts, ping-pong tables, entertainment, baby park with inflatables and games for children, cocktail area and hydromassages. - prices blocked for summer 2018! - room with balcony "Sea View" without additional charge (subject to availability)! - Children 2 - 14 years: 50% discount! In 3rd / 4th / 5th bed! - Infant 0 - 2 years: "basic fee" 10 euros per day! - Boys: 20% discount! In 3rd / 4th / 5th bed! 1/6 - 15/6 € 475 per week per person! - prices blocked at 2018! room with balcony "Sea View" without supplement (subject to availability)! Children 2 - 14 years: 50% discount! In 3rd / 4th / 5th bed! Infants 0 - 2 years: "base fee" 10 euros per day! Boys: 20% discount! In 3rd / 4th / 5th bed!